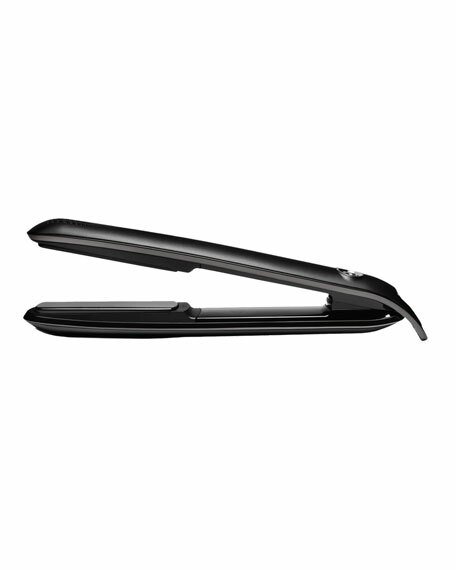 ghd eclipse is our groundbreaking new styler that styles faster with less heat. With the ability to tackle any hair texture quickly and easily, creating long lasting gloss and unbeatable shine. Using new, innovative and patented tri-zone technologydeveloped exclusively by ghd scientists to take hair styling into a new eraghd eclipse can radically transform even the most challenging hair, quickly and easily without turning up the heat. It can also style larger sections of hair in a single stroke, making styling significantly faster on all hair types. The new ghd eclipse uses the optimum heat of 365°F to deliver the best and fastest results yet, whilst actually making your hair stronger! The new tri-zone technology also uses three quick-thinking sensors on each plate to ensure there is no loss of heat during styling, locking in unbeatable professional results and shine for longer. For in-store inquiries, use sku #288823.